Undoubtedly this is the discipline that generates more adrenaline. By gymnastic exercises, instructors teach students jump posture for trot and canter. 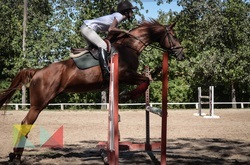 As the rider progresses, learns to jump isolated fences and latter in routs to compete, either internally or in official competitions contests.